Friday, December 14 update here. Telegraph Avenue protected bike lane project in the Temescal barely survived Oakland Public Works Committee this week and now to full Oakland City Council December 11, but did not get heard due to a super long agenda. Telegraph Avenue has been continued to Friday, December 14, 11:00am, but probably won’t come up until after 12noon. Please come and show your support at City Hall if you can, speak, and send your Oakland Councilmember an email of support. They need to hear from everyone. Timing: Agenda item S15, towards the end. Join us before at Cafe Van Kleef while we await the agenda item. Tips: When emailing your council member, include your connection to Telegraph Avenue. For example: I bike Telegraph, I walk Telegraph, I live on or near Telegraph. Up until a year ago, Bike East Bay and Walk Oakland Bike Oakland’s strategy was to first complete the build out of protected bike lanes in KONO District, then turn our attention to Temescal. The protected bike lanes in KONO are a work-in-progress, and Oakland received a $4.5 million state grant to upgrade Telegraph in KONO with permanent curbs, bus boarding islands, and other safety improvements. Those improvements are scheduled for 2020, and once complete, will improve parking compliance, create more efficient transit operations, increase numbers of people safely walking and bicycling, and allow local businesses to enjoy even more customers. A year after KONO’s protected bike lanes went in (in 2016), sales in the District rose 9%. Earlier this year, the Temescal District successfully convinced the Oakland Department of Transportation to commit to repaving Telegraph to 52nd street in 2019. Crosswalks and necessary safety improvements are included. 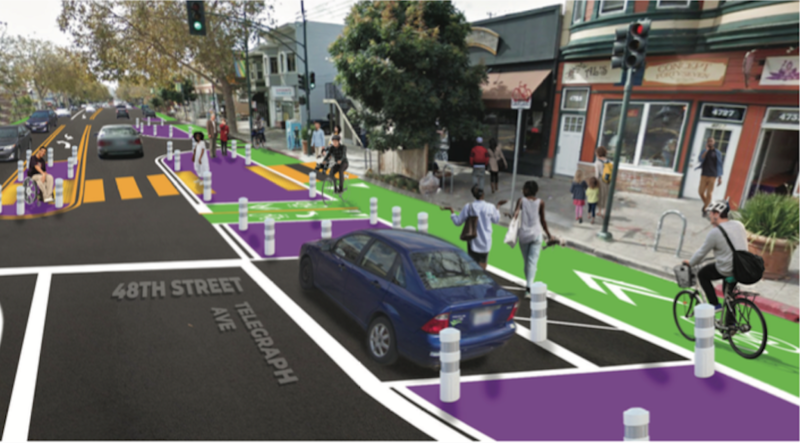 The Oakland Department of Transportation has committed to putting a bike lane on Telegraph Ave., and we want to make sure the city considers the safety of all users in the design of this street. Two bike lane designs have been developed for this section: 1) protected bike lanes, and 2) buffered bike lanes. A survey conducted by the department reveals 80% of respondents want protected bike lanes, shown above. Both designs include repurposing one vehicle travel lane in each direction into a bike lane. Parking lanes remain, but 20%-28% of on-street parking is removed to improve pedestrian safety, with commercial loading zones added. Immediate spaces alongside streets will have metered parking where there are businesses, adding 109 metered spaces to the Telegraph corridor. Contact your local council member today!